Looking for a great fund raising idea? You just found it! Get ready to set sales records and hold a banner event for your organization with Savory Foods. We're proud of our highest quality standards. Our quality control systems are among the highest in the industry. Amazing quality, amazing flavor, and amazing profits come together at Savory Foods. Seven irresistible flavors join forces to create a powerful and effective fundraising product line. Quality, gourmet taste... Ready for snacking. All natural ingredients! Lava-licious chocolate fudge and peanut butter cakes. No preservatives or fillers. Try all of our delicious varieties. 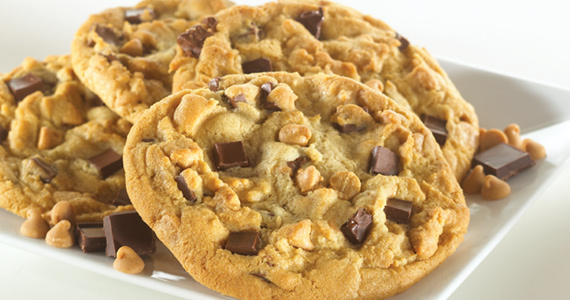 Homestyle Ready-to-Bake Cookies contain only the finest ingredients: wholesome oats, plump raisins, brown sugar, and real HERSHEY'S® Chocolate Chips and REESES'S® Peanut Butter. Savory Foods is proud to manufacture products that encourage a fun, at home family activity... fresh, Homestyle Ready-to-Bake Cookies. Our uniquely delicious cookie dough is a great family treat, and it's fun & easy to enjoy together. Most people compare our cookies to the expensive gourmet cookies at the mall. However, our cookie dough is not available in any store. Savory Foods Homestyle Ready-to-Bake Cookies and our exclusive Cookie Cube™ are available only as a fund-raiser. For variety, we've added both Gourmet Caramel Corn (a favorite family treat) and Lava-licious Fudge Cakes (a dessert that's out of this world.) Our delicious products have helped thousands of schools, churches, cheerleaders, little leagues, soccer teams & other non-profit organizations raise funds in a new, exciting & unique way! Savory Foods is a brand families throughout America trust for flavor and integrity. Learn how your organization can profit from our system.